Muslims around the world are set to mark Ramadan, a holy month when many fast from sunrise to sunset in order to focus on their spiritual life and get closer to God. 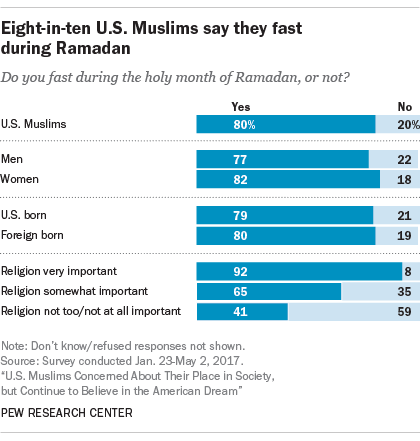 In the United States, the vast majority of Muslims celebrate Ramadan, with eight-in-ten saying they fast during the holiday. 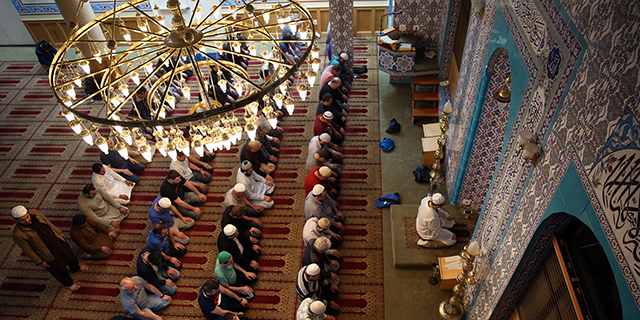 In fact, more Muslim adults say they fast during Ramadan than say they pray five times a day (42%) or attend mosque weekly (43%), according to a 2017 Pew Research Center survey of U.S. Muslims. And far more women fast during Ramadan (82%) than wear the head cover, or hijab, at least most of the time (43%). Fasting for Ramadan is common across all the demographic groups that make up America’s 2.15 million Muslim adults. For instance, similar shares of Muslim men and women (77% vs. 82%) say they fast, and there is little difference between Muslims who were born in the U.S. and immigrants (79% vs. 80%). Not surprisingly, roughly nine-in-ten U.S. Muslims (92%) who say religion is “very important” in their lives observe the holiday. Among Muslims who say religion is “somewhat important,” two-thirds (65%) say they fast. But even among American Muslims who say religion is “not too” or “not at all” important, a substantial share (41%) say they fast. Ramadan also is widely observed by Muslims around the world, according to a Pew Research Center report published in 2012. Indeed, in most of the 39 surveyed countries with sizable Muslim populations, more than nine-in-ten Muslim adults fast, making it the second-most-observed of Islam’s Five Pillars, behind only the shahada, the affirmation of belief in God and the Prophet Muhammad. The ninth and most sacred month of the Islamic calendar, Ramadan marks the first revelation of the Quran to the Prophet Muhammad. Because Muslims follow a lunar calendar, the start of Ramadan falls on a different day each year on the Gregorian calendar. Aside from those who are ill or traveling, Muslims are required to abstain from food, drink and sexual relations during daylight hours throughout the month. During this time, many pious Muslims traditionally devote more time to prayer, reflection and helping the needy. Ramadan also is a time for celebrating and socializing. Muslims usually gather with family and friends at sundown for a communal breaking of the fast, known as iftar, and then spend the evening eating and catching up on social visits and entertainment. At the end of Ramadan, Muslims traditionally celebrate the Eid al-Fitr holiday with sweets, gifts for children, charitable donations and social events.